Thursday January 31, 2019-Deputy President William Ruto has issued a tough warning to politicians whoare mentioning his name while campaigning for 2022 presidential election. 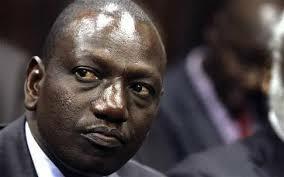 A number of politicians led by former Gatanga MP, David Murathe and Mombasa Governor, Ali Hassan Joho have been going around the country claiming that Ruto is not fit to vie for presidency in 2022. But in a statement on Thursday, Ruto told those busybodies to leave his name out of "their shenanigans" as he is working to support the President to ensure that Jubilee's Big Four agenda succeeds. Through his secretary of communications David Mugonyi, Ruto asked such individuals to use their energy more productively. "At no time has the Deputy President approved, canvassed or engaged in any other form of preparation for a presidential or another campaign after the last presidential election," Mugonyi said. “The Deputy President, therefore, asks those running noisy charades and mock-campaigns to use their energy more productively while those funding the same to find a better use for their resources," Mugonyi said. The spokesman also said the DP is a democrat who believes that campaigning must be done at the appropriate time, in an organised, systematic manner. "...that gives candidates the opportunity to have quality engagement with the people within a political party and based on issues and policies," he said.